Novelty bacon gifts are unique products to give as a funny present to any bacon lover. If you haven’t browsed the web for bacon gifts before you will surprised at just how many everyday items are available in the bacon format. Some of these novelty bacon gifts are foods with a twist and some are actually day to day accessories you can use. We have compiled a list of the best 10 novelty bacon gifts available. We all love a bacon sandwich for breakfast but with work or a busy home life we just don’t have the time to make one every morning. That’s where bacon toothpaste comes into play. Now you can have that fresh bacon flavour circulating your taste buds as soon as you get up. What better way to start the day than with fresh bacon breath! So once you have brushed your teeth with the bacon toothpaste you can have a wash with this novelty bacon soap. Yes it smells a bit like soap but that’s what you would expect, however it also has a wonderful aroma of freshly fried bacon. It has bacon soap written on it and comes in an attractive tin. Ideal to display in your guest bathroom, this is one of the most practical novelty bacon gifts going. Now you can carry around a handy little lip balm stick all day long to get a shot of bacon any time you want one. Can also be used to keep your lips moist too. Beware that your lips are going to be so tasty that you will be constantly licking them and salivating. Best to check who’s around when applying. Novelty bacon gifts even come as sweets. Not much to say about these except that they are bacon flavoured candies. Either give as a novelty gift or hide them in a pick and mix bowl and see who gets a surprise. A bit like Russian roulette of bacon candy. Spend a lot of time in the car or truck? Get cravings for bacon while counting down the miles to the next greasy spoon cafe. Then this handy bacon air freshener will soothe your cravings as it swings around and wafts it’s deliciously popular bacon aroma around the cab. 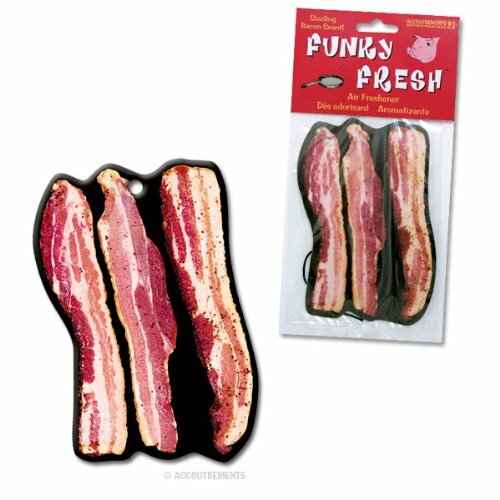 The bacon air freshener makes it into number 5 in our novelty bacon gifts list. All these products are available from here. 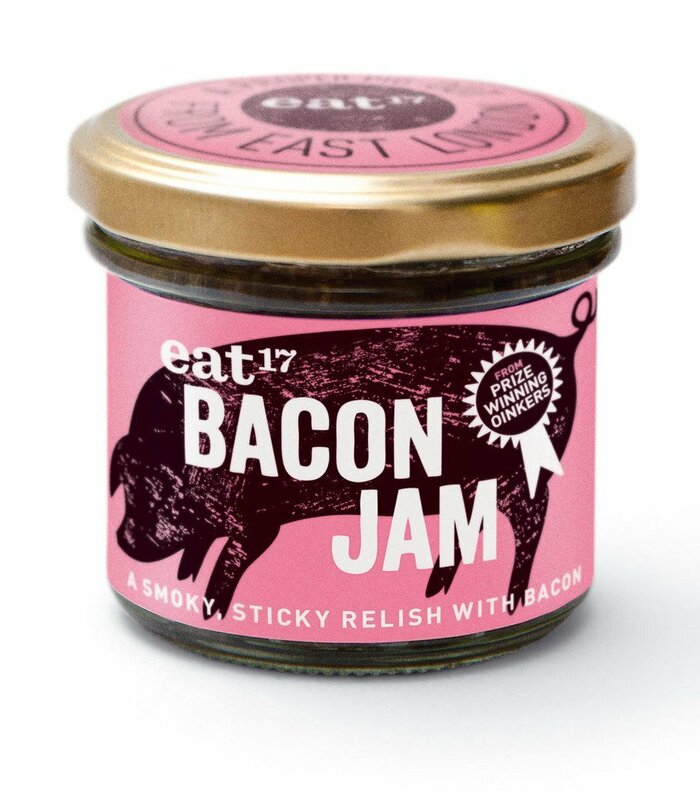 Contains real bacon in this jam. Ideal to spread over some crusty bread or a few crackers. Could also be classed as a relish or a spread. Put it on your hamburger, use it as a dip or eat it out the jar. If you don’t fancy it yourself then wrap it up and present it to someone who loves novelty bacon gifts. 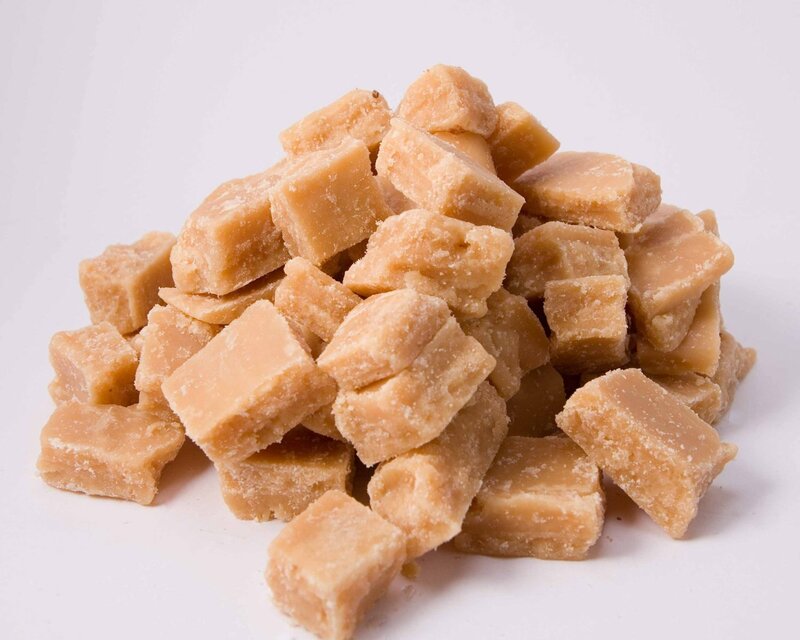 Another one to add to the novelty bacon gifts candy range is this traditional bacon fudge. Handmade and carefully balanced to give a bacon and sweet taste. It crumbles in the mouth and makes a perfect stocking filler for any bacon lover. 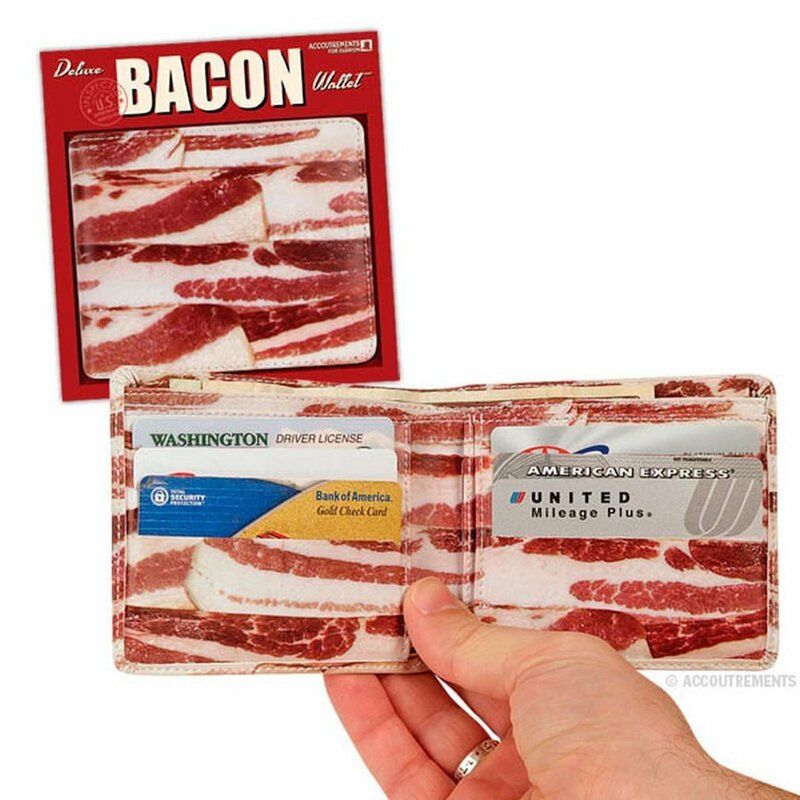 Store your hard earned bacon in this novelty bacon wallet. Sandwich the cash together in a faux leather mens wallet which looks inside and out of raw bacon. Very unique and bound to get plenty comments when you pull it out your pocket at the till. A novelty way to get some bacon taste going is to try it as bacon popcorn. If your fed up with the traditional salt, butter or toffee and love bacon, this has to be worth a shot. It doesn’t have the best reviews but the novelty factor still puts it up there with the most unusual novelty bacon gifts that it’s worth a go, even if it is a once only sample or gift. There isn’t many novelty bacon gifts that you can wear so these socks are ideal as they can be worn discreetly. Overlapping bacon strips make these socks nice and colourful but with a closer look and and an observant eye, your friends will realise they are bacon. Makes a great novelty gift and conversation piece. Remember you can buy all these online and they don’t cost a lot with many under 10 bucks. There you have it. Probably 10 products that you never knew existed. So if you’re mad on bacon or just looking for novelty bacon gifts to use as stocking fillers or joke presents then hopefully these ideas have inspired you. Happy Bacon Shopping! Messy Bedroom Sign – This room is not a mess! Miracle Snoring Cure for Loud Sleepers!